This week�s featured printer is the Zebra� ZXP SERIES 7 ID Card Printer, a high-speed direct-to-card solution that affordably provides near photographic print quality and vivid colors. Designed for medium- to high-volume applications and/or instant card issuance this card printer is Zebra�s highest performance direct-to-card printer�and can simultaneously print, encode and laminate. It�s a rock-solid value and handles any organization�s high-volume card-production requirements with impressive easy-to-use results. If you have the need for speed, the ZXP7 is fast! Zebra�s ZXP SERIES 7 ID card printer/encoder provides a great card-printing solution for organizations that print cards regularly in higher volumes. The ZXP SERIES 7 is very well suited for governments, universities, healthcare organizations, service organizations, and retail/hospitality businesses. Government Agencies � Facility access, certification cards. Colleges / Education � Student IDs, library cards, event cards, etc. Retail and Hospitality � Hotel access cards, cruise IDs, membership cards, loyalty cards, gift cards, etc. 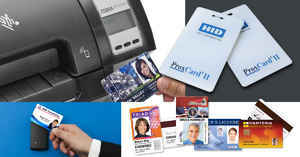 Secure Identification and Access � Employee IDs, visitor badges, access control badges. Workhorse Performance � The innovatively designed Zebra ZXP SERIES 7 single- or dual-sided printer delivers reliable, consistent performance and offers a variety of user-friendly features. With an impressive 250-card covered input feeder�and a single card feed capability�the ZXP SERIES 7 is designed for high use and readily and produces photo-like high-quality cards with little user monitoring or intervention. Designed for any organization with daily card-production requirements (e.g., hotels, hospitals, colleges, service providers, retailers), the printer has the features needed to keep up with your daily workflow and produce great-looking ID cards consistently�including Zebra CardStudio� software that makes card design and production professional, smart, and easy. The ZXP SERIES 7 is built for heavy use and can produce up to 1375 monochrome or 300 color single-sided cards per hour, up to 225 color dual-sided cards per hour, and up to 200 dual-sided full color cards with lamination. Zebra achieves this impressive speed by allowing three cards in the print path at a time��getting the next card to the printhead faster than any other printer. The Series 7 features image processing technology that delivers high-speed printing without diminishing crisp image quality. Importantly, the ZXP SERIES 7 printer comes with a 2-year unlimited warranty on the printer and the print head, another valuable feature and evidence of the unit�s durability. Single or Double Sided � Whether you want dual-sided printing or single-sided, the ZXP 7 steps up. Your decision on whether to go with a two-sided printer depends on the amount of information you need to put on your cards. For many applications cardholder information is limited and a single-sided ID card is more than sufficient. It�s best to ascertain the amount of information your cards need to hold before selecting your ID card printer. Built-in Ethernet and USB connectivity � Multiple users can be authorized to operate printing and encoding functions safely and reliably over your network, and you can print to one or more networked card printers, with USB 2.0 and Ethernet 10/100 connectivity. This network flexibility makes the Zebra ZXP SERIES 7 Duplex printer a great choice in many different operations. Direct-to-Card Printing � The Zebra ZXP SERIES 7 uses a combination of dye-sublimation and thermal resin transferdirect-to-card printing for vivid, full-color images, or monochrome technology, single- or double-sided. This system produces high-quality cards with clear, sharp, color-rich edge-to-edge images with precise color control, crisp black text and readable barcodes whenever you�re ready. The Series three uses only True Colours� ix Series� ZXP 7 high-performance ribbons with intelligent media technology for brilliant color. Highly Adaptable Modular Design � Serving most any card printing duty, the ZXP SERIES 7 contemplates your need to change and grow and offers versatility and flexibility. With its optional upgrades you keep up with card-printing needs as business operations grow and change. The ZXP SERIES 7�s modular design allows users to easily upgrade and add magnetic-strip, smart-card encoding, and lamination options. The ZXP SERIES 7 printer system can readily change along with your organization�s needs�which means genuine flexibility. Optional Magnetic Strip encoding � Print and encode cards in one pass, and save a lot of time. Magnetic stripe encoding (AAMVA and ISO 7811 contact encoder new and re-encoded, tracks 1, 2, and 3, high and low coercivity, stripe down, 30 mil card only). OptionalSmart Card encoding � Contact and contactless AAMVA and ISO 14443 A&B and ISO 7816, and EMV Level 1 certified card encoding to print and encode your cards in a single process, and capable of encoding over Ethernet or USB. Optional FIPS 201-compliant one-pass single- and dual-sided lamination (on 30 mil cards) � Zebra's patented wasteless laminate design features True Secure i Series laminates and eliminates the need for carrier material, backings and liners (reducing waste and cost). Optional250-card capacity output hopper (30 mil). Extends card life by creating a wear-and-tear-resistant barrier. Reduces fading and dye migration from sun exposure. Increases card security by making them difficult to copy when holographs are included (holographic lamination). Reduces the need for card replacement and associated costs. The system uses clear laminates, standard holographic laminates, or custom holographic laminates. Holograms add yet another layer of security because they�re hard to duplicate. 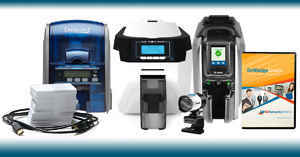 Easy to Operate and Maintain � Versatility and utility are delivered through the ZXP SERIES 7�s many features, like its use of the most common software drivers, acceptance of widely used PVC card types and sizes (and thicknesses�it automatically adjusts to the thickness of the card), easy-to-use drop-in ribbons with disposable ribbon cartridges, ribbons and laminates use intelligent media technology to automatically detect and calibrate the printer, integrated cleaning roller included on each ribbon, USB 2.0 connectivity, and high-resolution (300 dpi) edge-to-edge printing. The high-capacity quick-replace Load-N-Go� smart ribbon cartridges are eco-friendly, use less plastic and biodegrade better than competing brands. The ZXP Series 7 printer also boasts a separate card-reject bin. It automatically routes any cards that fail encoding, so these cards don�t get imaged or laminated. On recovery from errors, it also routes failed cards to the reject bin. Cost Effective Solution � The Series 7 is easy on the pocketbook too. 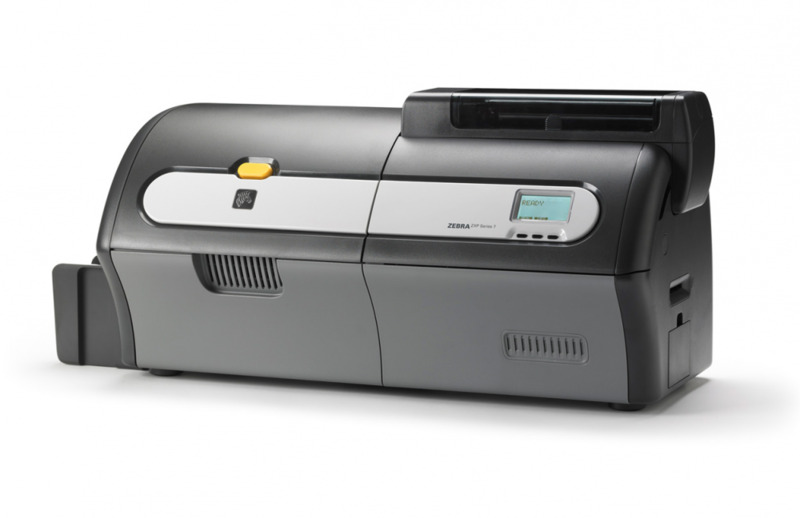 It features an Energy Star� rating, multiple ribbon options, the ability to select 10 � 50 mil card thicknesses, all making it a low-cost ownership option and the most cost-effective card printing solution in its class. Intuitive User Interface � The Zebra ZXP SERIES 7 card printer/encoder provides an easy-to-understand graphical status display (a clear LCD control panel) to easily identify the status of your printer (a 21-character/6-line operator control display and color touch points). 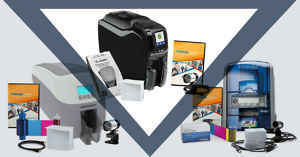 Security Features � This is a convenient and secure printer and encoder system, with advance security features to protect the printer and media�physical locking mechanisms, controllable access privileges, optional lockable enclosure and card feeder, and software that tracks and restricts activities. Standard Kensington� lock feature and optional enclosure lock with obscured�100-card capacity�output bin make the ZXP Series 7 ideal for secure card-printing solutions. The ZXP SERIES 7 reliably prints in monochrome or vibrant color and encodes technology cards (supporting magnetic-stripe and smart-card technologies), and is built to meet the needs of diverse businesses, schools, governments, and medical institutions. It flexibly customizes cards for any application needed: identification, membership, access control, time and attendance, customer loyalty, and event passes. It�s also scalable, permitting users to upgrade simply and conveniently by adding modules. We like to provide organizations with pertinent information supporting effective evaluation of our card-printing solutions. 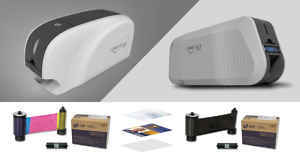 These product reviews help customers better distinguish among the many card printers available today, and select just the right ID Card Printer for their needs and budgets. 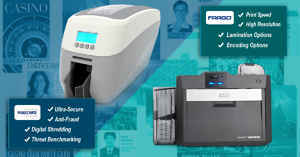 Call IDSecurityOnline today at 800-897-7024 or visit our ZXP7 page to get your ZXP7 card printer.